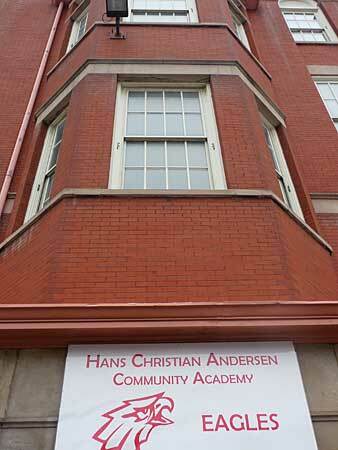 Andersen Community Academy elementary school appears likely to close June 17. Chicago Public Schools interim chief executive Terry Mazany is addressing a $720 million shortfall in Chicago's $5.28 billion schools budget by closing a half-dozen low-enrollment schools. Andersen's remaining 61 students in grades 6, 7 and 8 will be offered slots at LaSalle II, the magnet elementary school that shares the Andersen building at 1148 N. Honore. To continue to operate with so few students would deny them better school options, Mazany said in the March 23 CPS announcement. Hans Christian Andersen school opened on the site in 1884, named for the author of "The Little Mermaid." For earlier grades, Pritzker School at 2009 W. Schiller already has replaced Andersen as the designated neighborhood school. Ald. Proco Joe Moreno is vehemently opposed to Andersen's early closing because of the timing. CPS is proposing this change in late March when Andersen families have missed the standard mid-December deadline to apply to other CPS schools, as well as deadlines for most charter schools. The merger could bloat classroom sizes in LaSalle II’s upper grades, or require split classrooms with multiple grades in one room. Details of the merger are yet to be finalized, but LaSalle II’s lottery results were sent to parents on March 18 based on a standard classroom size. A public hearing is scheduled for Thursday, April 7 to hear from both Anderson and LaSalle II families. The hearings are scheduled to last two hours, starting at 5:30 p.m., in the school board's 5th floor chambers at the CPS central office, 125 S. Clark. Meanwhile, CPS no longer will honor an agreement to hold half the seats at LaSalle II for neighborhood pupils. Three years ago when the Andersen phase-out was announced, Ald. Manny Flores said he had negotiated a 50-50 ratio of students within 1.5 miles of the school. Flores and former CPS intergovernmental affairs director Michael Merchant believed that the more generous ratio was to be maintained in perpetuity. However, Abigayil Joseph, head of the Office of Academic Enhancement, now says LaSalle II's local admissions quota for kindergarten will be the standard proximity allowance for magnet schools of 40%. CPS is holding to this despite an East Village Association protest in February. "It is our concern that the commitment made to the neighborhood is not being honored," wrote President Greg Nagel, noting the ratio would have implications for fall admissions. The 65 newly enrolled students from the current school year were not geocoded, so we do not know the current ratio of newly enrolled students living the within the 1.5 mile radius. However, Principal Suzanne Velasquez Sheehy has not been allowed to fill 2 open kindergarten seats from the proximity wait list. The central office has decided to let those seats remain open until next school year. Older grades are filled to capacity. EVA last year sought to reduce the proximity radius to 0.75 miles. There's absolutely no potential for that change. Other elementary schools to be closed include Carpenter, at 1250 W. Erie. Students there will be merged into Talcott, at 1840 W. Ohio. Carpenter is phasing out and has a projected fall 2011 enrollment of 108 students in grades 3 through 8. Because of low enrollment, it has split-grade classrooms. The Chicago Grand Neighbor's Association is looking to help Talcott, which is within CGNA boundaries. Many active CGNA members live near the school.